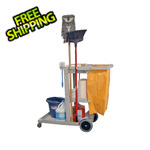 This janitor cart is made of heavy duty molded plastic for chemical and corrosion resistance. This cart includes a removable black nylon bag for disposing of dirty laundry or trash. Bag easily hooks on around interior rim of push handle. Fixed height shelves allow storage of cleaning supplies and more. Raised edges help retain cargo during transport. Top shelf features integral hooks to hold mops, brooms and more in place. 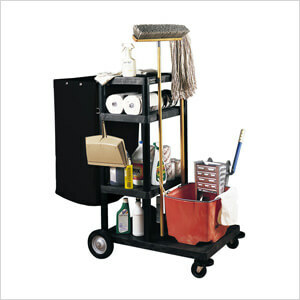 Janitor carts offer 500 lb. total load capacity.